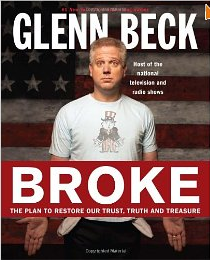 This is part V of XXI of a detailed analysis of Glenn Beck's newest book, Broke: The Plan to Restore Our Trust, Truth and Treasure, co-written with the help of Kevin Balfe. Keep in mind that it was published on 10/16/11, one month before Beck admitted complete ignorance "with the economy." Chapter 5 is entitled "America's Debt Progresses the Wrong Way," and the primary subject is President Wilson, the man Beck most loves to hate. Glenn Beck symbolizes U.S. treasury? In this chapter about how debt advanced during the progressive era in U.S. history, Glenn Beck takes on President Wilson and far less so President Theodore Roosevelt. What does Beck spend the first two pages discussing? The racism of Wilson and Roosevelt. Beck never mentioned that President Jefferson, a Founder that Beck admires, condescendingly considered the native Americans to have been his "children. "(1) Two pages in a chapter on debt are used to explain that Wilson was a racist and Roosevelt did nothing to stop the unjust discharge of 167 blacks from the military. Broke? Maybe that describes Beck's focus. No, that would have been called Still Broken as Beck has suffered from Attention Deficit Disorder most of his life. Maybe Broke aptly describes Balfe's work to look over Beck's contributions to this work of historical cherry picking. Beck begins by calling Wilson a "patron saint" for leftists, a "holy father" of progressivism. Clearly Beck has never read a word by Noam Chomsky. In Hegemony or Survival, Chomsky spends a whole chapter denouncing Wilson and his "idealism" in foreign affairs. (2) For an author, Beck knows little about books, especially ones by leftists. The same is true about many of his false claims about the mainstream media. Knowing little, and talking a lot are the mainstays of Beck's "dissent." Still hammering on Wilson on the third page of the chapter, Beck wrote, "I guess that during those phone calls God must have been plying Wilson with great ideas on how to destroy America." This coming from the author who claimed that the plan that will be described in Broke was conveyed to Beck by "God." It took five chapters, but as certain as night folds into day, Beck expressed an opinion that was complete hypocrisy, something Beck does almost as routinely as he lies. (3) Beck's hatred of Woodrow Wilson is so extreme that he can't understand how he projects onto the 28th president what he himself claims about communicating with "God." Of course, Beck doesn't believe his plan will destroy America. Of course not, because Beck is such an esteemed economist...make that college drop out. (4) What could go wrong following Beck's ideas on economy and finance? There is plenty of reactionary spin in this chapter, as one would expect from a yellow propagandist. Beck asserts that "Wilson saw government as a new god,"(5) that Wilson's Secretary of State, William Jennings Bryan, "took the attitude that the wealthy must be punished for their affluence" because Bryan asked "why should not those sections pay most which enjoy most? "(6) and that the idea of government restricting enterprise is "the hinge of history swinging backward. "(7) For Beck, it's obvious that corporations controlling public life in the U.S. is "progress." For Beck, forward is backward and vice-versa. Beck asserts that the President Wilson's attempt to be a more effective commander and chief "got so creepy that" he created a "new standard of manhood" for soldiers. A "Commission on Training Camp Activities" was established that heavily regulated the lives of soldiers preparing for The Great War. (8) So "creepy!" What was creepy is Beck's indifference to its effectiveness, as if the U.S. had lost that war against Germany. In a side bar entitled the "Deficit of Tru$t," Beck quotes Senator Owen from a letter supporting the establishment of the federal reserve in 1913. Owen wrote that "The first advantage is the protection from panic, because panic will be impossible under this system." Beck added, "It's too bad Senator Owen wasn't alive to see how that worked out in 2008." Problem is there was no financial panic in 2008; there was no run on the banks. It was a market panic, a different animal than what Owen referred. Beck could have pointed to the panic of 1929, but he didn't. So much for accurate scholarship. That side bar is contained in a section of the chapter subtitled "But Progressivism Worked ... Didn't It?" Beck asserts that during World War I federal expenses "rose 2,494 percent" and the "national debt went from $3.6 billion to a whopping $27.4 billion." "Whopping." By today's standards, that is chump change. Beck continued: "World War I, of course, played a role in this expansion, but, like any good progressive, Wilson did not let a serious crisis go to waste. Instead of temporary spending or taxes, as had been the norm...Wilson pushed through legislation that would continually expand government without an expiration date. "(9) The example Beck gives for a domestic, non-war program that wouldn't expire? He didn't offer an example. Just take Beck's word for it because he is so trustworthy. Uh huh. Beck's main target in this section is the progressive tax rates Wilson pushed to have enacted. With an expensive War to End all Wars, as it was called in Wilson's time, raging, Beck notes that "By April 1917, with the war as an excuse, new changes were made to the income tax exemptions." Excuse? A war of existential necessity and global scale is for Beck "an excuse." Beck continues to note that the "lowest tax threshold wend from $3,000 down to $1,000" (without mention of their tax rates), "the normal tax rate was bumped to 2 percent, and the top rate jumped to 67 percent (and then to 77 percent the following year.)" Beck then points out that the top tax rates remained in place at the conclusion of the war, not exactly surprising considering the size of the debt that had accumulated by then. Beck claims, however, that "the goal was a new concept in America: redistribution of wealth. "(10) Paying off the "whopping" debt that Beck had mentioned just the page before was apparently forgotten. Beck really is "riddled with Attention Deficit Disorder" as he claims. Beck's real concern with the progressive taxation employed by Wilson is addressed in the next paragraph. He notes that in 1916, when the top tax rate was 15 percent there were "206 people in the United States who had million-dollar incomes. But by 1921, when the top tax rate was at a stratospheric 73 percent, only 21 people filed tax returns as millionaires." Beck concludes that this statistical information "proves one of two things: Either 90 percent of the country's millionaires went bankrupt (or died), or millionaires are really, really good at dodging tax rates they consider to be too onerous." Actually that information does not prove that. Another possibilities was that those who were barely millionaires slid to beneath the million dollar range of income, i.e. what one would expect under a policy to redistribute the wealth. The Gross Domestic Product of the nation actually increased during the war, so overall prosperity was not adversely affected. Beck also addressed those who were making between $300,000 and $1 million. Their numbers also shrank during the war from 1,090 to 225. Beck maintains certainty that the cause was cheating on their taxes(11), but he does not comment on the patriotism (or lack there-of) of those unwilling to contribute to the war effort. Beck also neglects to address the remainder of the data for this period. How did the middle, working and under classes do in this period? Beck didn't care to notice. Why should he? The data Beck's concern about taxes and prosperity does not extend to the vast majority of people who watch his show and read his books, the middle, professional and working classes; Beck is concerned about the prosperity of people like Glenn Beck, i.e., the rich and the wealthy. Beck claims that his concern for the upper classes is derived from Adam Smith, "as he put it in The Wealth of Nations, 'When the rule of arithmetical proportion is broken, the door is open to extortion.' "(12) Does Beck cite The Wealth of Nations as the source of that quotation? No. Beck uses the views of libertarian author Charles Adams and his book, For Good and Evil: The Impact of Taxes on the Course of Civilization. Does Beck suggest that someone walked through the "door ... to extortion?" No. Does Beck offer any explanation of the "arithmetical proportion?" No. Beck does offer his reactionary spin (again): high tax rates on income earners at Beck's level of income is "a federal shakedown." Paying for the war? Patriotism? Beck cheery picks his data and then offers a perspective that has less to do with winning and paying for the war than it has to do with Beck's bias as a rich man. Beck concluded this chapter by noting that the progressive movement didn't end, "it just took a temporary hiatus so that Americans could forget how poorly those progressive ideas translated from theory to reality. "(13) The economic growth that occurred during a major war was bad for the country? That is part of reality Beck ignored in his cherry-picked history of this period. What other progressive ideas poorly translated from theory to reality? Woman's suffrage. What a terrible reality. The meat inspection act because Beck knows that people would prefer to consume tainted bowels and dirty meat rather than clear, pure animal flesh. The pure food and drug act which requires companies to accurately label ingredients of processed food was terrible because for Beck, food ignorance is bliss. The Clayton Anti-Trust Act and the Federal Trade Act prohibited the creation of monopolies and unfair business practices respectively. (14) These acts strengthened the market mechanism by prevents single companies from growing to large and eliminating competition which is what keeps prices competitive. These are "bad realities" for the pro-monopoly, anything goes in the economy Beck. Beck adds a tiny graphic depicting a bag with a dollar sign on it at the end of every chapter. Ka-ching, Mr. Beck, ka-ching. Beck publish his ideas, people actually buy them and he score big. "Ka-ching," Beck exclaims all the way to the bank: "ka-ching!" What made Woodrow Wilson especially dangerous was that he had taken the faith of his Presbyterian minister father and his mother, the daughter of a Presbyterian minister, and mixed it with a lust for power leavened with a heaping dollop of socialism. In fact, in his own writings, Wilson made no secret about his fixation with power. In his book Congressional Power, Wilson wrote, "I cannot imagine power as a thing negative and not positive." Apparently, atrocities at the hands of dictatorial governments and regimes never crossed his mind, even as the country suffered through a world war. First things first -- Wilson's book was not called Congressional Power. It was called Constitutional Government in the United States, as Beck's "footnote" for this quotation makes clear. However, the "footnote" claims that the book was published in 1917, which is wrong. It was published 1908. This is significant, in that World War I had not yet broken out and Wilson would therefore have had little reason to reflect on the war-induced suffering of his country, as Beck claims he should have. It is very difficult for public opinion to judge such a body as the House of Representatives justly, because it is very difficult for it to judge it intelligently. If it cannot understand it, it will certainly be dissatisfied with it. Moreover, it is very difficult for a body which compounds its legislation by so miscellaneous a process as that of committees to bring itself into effective cooperation with other parts of the government, -- and synthesis, not antagonism, is the whole art of government, the whole art of power. I cannot imagine power as a thing negative, and not positive. Presented in the (lack of) context Beck provided, that quote makes Wilson out to be licking his chops at the idea of amassing power. Presented in the proper context, we see that Wilson was actually discussing his view that governmental power arises through the cooperation of the various branches and not through "antagonism." awesome analysis. i was wanting to do something similar on my blog. your analysis is very well written and researched. do you plan on reading his new book agenda 21?